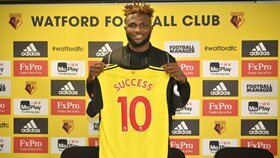 Nigeria international Isaac Success is aiming to repay the faith shown in him after penning a new five-year contract with Watford this week. The 22-year-old arrived the Hornets in July 2016 for a then-club-record fee and has gone on to make 35 appearances in all competitions, scoring four goals. Things have not always been rosy for Success since he joined the Hornets as he has struggled with injuries and loss of form, and had to be farmed out on loan to Malaga for the second half of last season due to his lack of first team opportunities. In his first words after signing the multi-year contract, Success told the fans and club that he's still developing as a player and they should expect more from him in the coming years. ''I think my full potential isn’t out yet, I’m still working on that. The club has seen a little bit of it, where they appreciate me already and I’m thinking there’s a lot more to come,'' Success said to Watford's official website. ''I owe the club, the fans, and the team a lot which I’m trying to develop now. Isaac Success is now represented by the same agency that looked after the affairs of Odion Ighalo during his time with Watford.